We recently brought you news about a new co-op game from up and coming developer DrinkBox Studios. Tales from Space: About A Blob has been announced as a PlayStation Network exclusive. Chris Harvey, DrinkBox CTO and Designer, shed some light on some new details on the co-op, which supports two players locally. In Tales from Space: About a Blob, two players can play simultaneously and interact by climbing or jumping off one another. 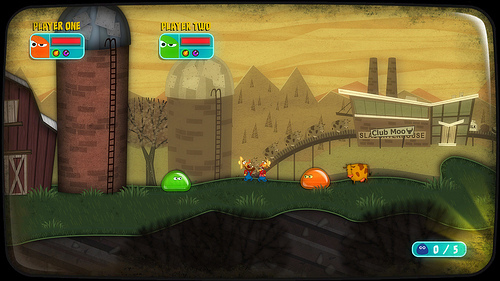 Although the goal is for the blobs to work together, players can choose to attack or push each other around if they want, and can compete to see which player is better at destroying the world. Around the office, people usually ping-pong back and forth between working together to solve puzzles, then messing each other up near obstacles or enemies. As for Home... you can definitely expect some unlockable Reward Items plus other Home content sometime after we launch. About a Blob has benefited from SCEA's Pub Fund program, which has spawned games like Burn, Zombie Burn. SCEA's Pub Fund program helps independent developers create exclusive games for the PSN while still allowing them to retain ownership of the IP. Help support independent developers yourselves by checking this game out when it releases early next year. Page created in 0.5098 seconds.